Armenian authorities should prepare their people for peace with neighboring states, the head of the Department of Foreign Policy Affairs of the Azerbaijani Presidential Administration Hikmat Hajiyev said in an interview with the TRT World, Trend reports. Hajiyev said that the fundamental cause of the Armenia-Azerbaijan Nagorno-Karabakh conflict is connected with the aggressive policy pursued by Armenia against Azerbaijan using force. He stressed that Armenia carried out a bloody ethnic cleansing against Azerbaijanis in the occupied territories and over a million Azerbaijanis are still forced to live as refugees and IDPs. 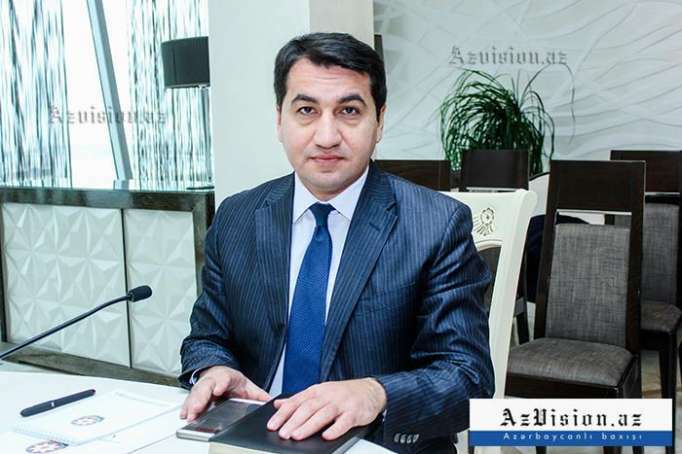 Highlighting the unacceptability of the status quo, based on the ongoing occupation, Hajiyev said that Armenia is trying to use the "fait accompli" attitude and continue the occupation. Hajiyev added that in order to achieve progress in settling the conflict, first of all, the fact of occupation must be eliminated and Armenian troops should be withdrawn from the occupied Azerbaijan territories. Noting that the basis for settling the conflict is enshrined in the relevant resolutions of the UN Security Council, the Helsinki Final Act and other documents, Hajiyev stressed the opportunities for a political solution to the conflict may appear after the withdrawal of Armenian troops from the occupied territories. Commenting on the Dushanbe Summit, he said that President Ilham Aliyev and the Acting Prime Minister of Armenia Nikol Pashinyan held a conversation, during which Azerbaijan once again demonstrated its constructive position. Hajiyev stressed that Azerbaijan is the most interested party in the soonest settlement of the conflict, because it has been suffering from occupation for over 26 years. Hajiyev underlined the fact that today, there are favorable opportunities for settling the conflict, noting that after the formation of government, Armenia should take steps to resolve the conflict. Answering the question "Is the ethnic reconciliation possible? ", Hajiyev said that Azerbaijan is proud of its multicultural values and culture of tolerance, and despite the fact that the national peace process is a complicated and time-consuming issue as part of the conflict resolution process, it is possible. "For this, first of all, Armenian troops must be withdrawn from the occupied territories and the return of Azerbaijani IDPs to their native lands should be ensured. In this aspect, measures can be taken to restore trust, full regional cooperation and secure ethnic reconciliation," he said. Hajiyev reminded that at present Armenia is isolated, does not have access to regional transport projects, but as a result of the conflict resolution process, it can take advantage of opportunities for regional cooperation. He called on Armenia to end its occupation policy, pursue a policy based on international law with neighboring states and the Armenian authorities should prepare their people for peace with neighboring countries.